Anna said she will not let her anxiety win. Howie said about her performance, “you are so important to be here.” He said with the Robin Williams death, it’s a real emotional time and thanked her. Heidi said “I feel the passion in your voice. I hope that your journey will continue with us.” Howard noticed that she changed her hair color and liked it. “I sense your passion with the other two songs you performed.” He said he disassociated himself from her story and thought that she was a bit more edgier with her other songs. Mel B loved it. “You contained yourself…well done sister!” said Mel B. Their dad was diagnosed with cancer, and they are working to make his last days happy ones. Heidi said I feel like you took this really vibrant Pop song and made it anemic. She also called the end “a bit sleepy.” Mel B said she loved it because “you took us somewhere with it” and gave them props for making it unique and their own. Howie said he agreed that they are lovely to look at like Mel B said, but it’s hard to follow an act like “Cornell Bhangra”. Howie also said, in the context of this stage and this show, “it was a little low energy.” Howard said “the first time I saw you, you were unbelievable. He said they always take risks and they were lack-luster. But they are worthwhile, and they do “take us somewhere” with their music. Mike said he’s “as normal as they get”. But at night, he turns into a Mystifier! At the beginning of his act, he put 500,000 bolts of electricity into the air. Mike invited Mel B to the stage to assist him in his routine. After she sat down, he told here that he placed Desmond inside of her. Mike presented her with his “scary spice doll!” Mike did things to the doll while Mel B felt the effects. This included poking, burning, and finally tasing her! Howard said she deserved it! Mel B yelled she doesn’t get paid enough for this and she felt she was being “unnecessarily tased.” Howard said he doesn’t like Desmond and doesn’t think he needs it and said it seems his children are traumatized by it. Howard told Desmond to go back home to the spirit world. Howie called it “truly amazing.” He said guys everywhere are going to figure out how they can do things to girls without being there. Heidi said the ash in the hands was fabulous, and glad that she didn’t have to get on the stage with him today. Mike said he picked Mel because he knows that she’s skeptical. A Picnic In A Wheat Field! He’s in the eighth grade going into the tenth, and said he started playing the piano at the age of four. Adrian said when he plays the piano he feels like he is having a picnic in a wheat field! During his performance, he was so animated with his piano playing that Adrian’s eye glasses fell off. Howie called him “Boythoven” Howard said we have to remind ourselves that this is a nine-year old. We just don’t know what’s in your future,” and said he has a flare that is remarkable! Adrian said he does realize how entertaining he is when Mel B asked him. She’s been doing comedy for twenty-five years. Wendy said she is addicted to making people laugh but took her career out of the fast lane and into the slow lane to raise her two step-sons. Heidi stood-up for Wendy and said she loved that she really made her laugh. Mel B said “finally a good looking woman that makes us laugh from beginning to end. That’s never happened before.” Howard said “you came out tonight like you own that stage. You came out like a rock star” and said she was in control. Howie joked that he’s known Wendy for 56 years (her ongoing lying about her age joke) and said every swing that she took was a home-run. Two of them come from a classical background, and two of them come from contemporary. That’s just beautiful and my favorite of the night! Howie said the sounds of their voices and the blending of the musicians was soothing and felt good! “I feel good. I feel soothed!” Howard said “America has a tough decision to make because they just knocked it out of the park!” He also said that he could see himself getting a rub down to that song. Heidi said she thinks they are a class act. They got together just a few days before AGT. They were placed together by their choreographer David Middendorp who wanted to audition for AGT. Both members of Blue Journey run dance studios and have had little time to rehearse for their Radio City performance. Their performance, most of which took place on the floor with visual aides, was perfection. They got a standing ovation from the judges. Heidi said “this was a very sophisticated performance.” She also pointed out that they are very inventive because a lot of it happened on the floor. Mel B said “you guys have brought something so special and unique to the show. I want you guys to win. You’re just incredible”. Howie said he doesn’t know how to describe the feeling. He’s been “Middendorped” – referring to Blue Journey’s choreographer. “This is the best dance I’ve seen ever on the show.” Howard said “this is very, very intelligent. In order to win America’s Got Talent, you have to have this kind of choreography.” He said they have the whole package. Seven acts will be going home. Taylor Williamson and an exclusive performance by last season winner Kenichi Ebina. Host Nick Cannon said last night’s show was one of the best sows that they’ve ever had. The winning act this season will win $1 million and headline a show at The Axis at Planet Hollywood Hotel in Las Vegas on September 26th and 27th. Cornell Bhangra and Sons of Serendip took to the stage to find out which one of them would be the first act continuing on to the Semi-Finals. It was Sons of Serendip! They said they were so grateful that America voted them through. Mel B said they where their favorite act of then night last night and was very pleased. Blue Journey, Kieran and Finian, Dragon House: The Agents were next. The act that made it through was Blue Journey! Nick asked what they were thinking and the reaction was, “everything and nothing. It’s just crazy. Heidi said she wasn’t surprised because they really one of the best acts last night. The runner-up last season was comedian Taylor Williamson. Taylor made a visit to AGT, but in a very unique way. In an AGT interview update with Taylor he said the show has changed his life, then he was interrupted by his “girlfriend” Heidi Klum. But, it was all just a nightmare that Heidi was having before show time. 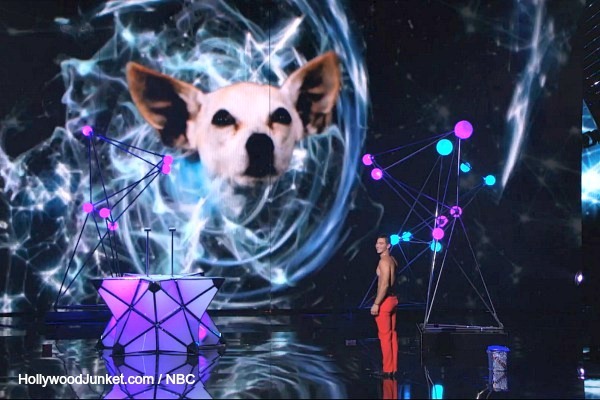 The winner of last season, Kenichi Ebina returned to the stage with a show that included digital versions of Heidi Klum and Howie Mandel – it was a plug for his new App that will be coming-out soon. Ebina is also performing his show in Los Angeles on September 20th and 21st. The next two acts were Christian Stoinev and Wendy Liebman. Christian Stoinev is the act that is going to the Semi-Finals. Christian said it’s an honor to be on the stage with the other acts and thanked the voters and said this is a dream, “and I’m so glad that I don’t have to wake-up.” Howard said America got it right, but Wendy was good too. He said the way to win this is to constantly surprise them and called him terrific and a great entertainer. Next, Nick announced the next act to be eliminated out of the next three acts – Mike Super, AcroArmy and Adrian Romoff, was announced as Adrian Romoff that was going home. The two acts left, AcroArmy and Mike Super, the judges would have to decide who would stay. Judges Votes: The judges had to vote between AcroArmy and Mike Super. Heidi called them both fantastic and chose AcroArmy. Howie said “Mike Super you dazzled us and made Mel B say things you’re not suppose to say on TV.” He said he reads what people are saying on Twitter which had a lot of buzz about Desmond. So, he voted for Mike Super. Mel B said AcroArmy was “unbelievable and entertaining. She voted for AcroArmy. Howard had the deciding vote and said “last night was a bit of a stumble. I think Desmond holds you down and I’m going to stick with that. He chose AcroArmy as the deciding vote! NEXT WEEK: The final twelve Quarterfinal acts performing at Radio City Music Hall next week will be – Bad boys of Ballet, Kelli Glover, Dom The Bom’s Triple Threat, Emil & Dariel, Nina Burri, Quintavious Johnson, Extreme, Jonah Smith, Jonatan Riquelme, Mothmen Dance, Smoothini, One Voice Children’s Choir.